The priest has a double task. One is to perform the sacraments and the other is to heal people so that they can worthily approach and receive Holy Communion. We have further pointed out that there are many priests who are priests outwardly and perform their function unhindered but in essence have defiled the priesthood, and that this is apparent from the fact that they are not able to heal. They perform the sacraments, and the gifts are sanctified through them, but they cannot cure others or save their own souls. On the other hand, there are laymen and monks who do not have the sacramental priesthood but can heal people because they have spiritual priesthood. We should like to dwell briefly on this point. Through baptism and the effort to keep Christ’s commandments all Christians have put on Christ, and in this way we share the royal, prophetic and high priestly office of Christ. This teaching is recorded in the texts of the New Testament. In the Book of Revelation John the Evangelist writes: To him who loved us and washed us from our sins in his own blood and has made us kings and priests to his God and Father... (Rev 1:5). The Apostle Peter says: You are a chosen generation, a royal priesthood, a holy nation, his own special people. (1 Pet 2:9). And the Apostle Paul writes to the Christians of Rome: I appeal to you therefore, brethren, by the mercies of God, to present your bodies as a living sacrifice, holy and acceptable to God, which is your spiritual worship. (Rom 12:1). In many Fathers too we find this teaching that every person is a priest of Christ in the sense which we defined and will develop further later on. St. John Chrysostom presents Abraham too as a priest because where there is fire, an altar and a knife, why do you doubt his priesthood? Abraham’s sacrifice was twofold. He offered both his only-begotten son and the ram, and above all, his own will. With the blood of the ram he sanctified his right hand, with the slaying of the child (which he had decided to do) he sanctified his soul. Thus he was ordained a priest, by the blood of his only-begotten, by the sacrifice of the lamb. Just after this, St. John Chrysostom exhorts his listeners: So you too are made king and priest and prophet in the laver: a king, having dashed to earth all the deeds of wickedness and slain your sins, a priest in that you offer yourself to God and sacrifice your body, and are yourself being slain also. All the faithful baptized in the name of the Holy Trinity and living according to the will of the Holy Trinitarian God are priests, they have spiritual priesthood. We prefer the expression spiritual priesthood to other terms like general or lay priesthood, because clergy and lay people alike can have this priesthood, and because not all the baptized have it, but only those who have become the dwelling place of the Holy Trinity. The faithful who have noetic prayer have spiritual priesthood, especially those who have reached such a degree of grace as to pray for the whole world. This is the spiritual service on behalf of the world. The prayers of these people who sacrifice themselves, praying on behalf of all, sustain the world and heal men. Therefore by prayer they become exorcists, driving out the demons which rule in human societies. This is the great work of those who pray unceasingly for the whole world. St. Gregory of Sinai wrote about this spiritual priesthood, which is also the essential foundation of the sacramental priesthood. For as we have said, those of the faithful who were healed and had noetic prayer were chosen to receive the special grace of the priesthood as well. According to St. Gregory, noetic prayer is the mystical liturgy of the mind. A person who possesses the gift of noetic prayer senses the operation of grace within him, which is purifying, illuminating and mystical. All who reach this state are priests. A true sanctuary is a heart that has been freed from evil thoughts and receives the operation of the Spirit, for everything in that heart is said and done spiritually. This passage from the holy Father prompts me to say that the spiritual priesthood is that which is to be consummated in another age, in the kingdom of heaven. Without wishing to dwell on the subject of the ineffaceable or non-sacramental priesthood, we stress the truth that the sacramental priesthood is for the benefit of the laity, to serve its needs, while the spiritual priesthood is that which will continue to be celebrated at the heavenly altar in the life to come. All who have spiritual priesthood are true clergy now and forever. This priesthood can include all categories of men, and naturally also of women. Therefore it is not very important that in the Orthodox tradition women cannot receive sacramental priesthood. They have the possibility of being the true clergy. Elsewhere St. Gregory of Sinai is explicit: All devout kings and priests are truly anointed in baptismal renewal just as those of old were anointed symbolically. The priests of the Old Testament were truly symbols of our truth, but our kingdom and priesthood are not the same in character and form. 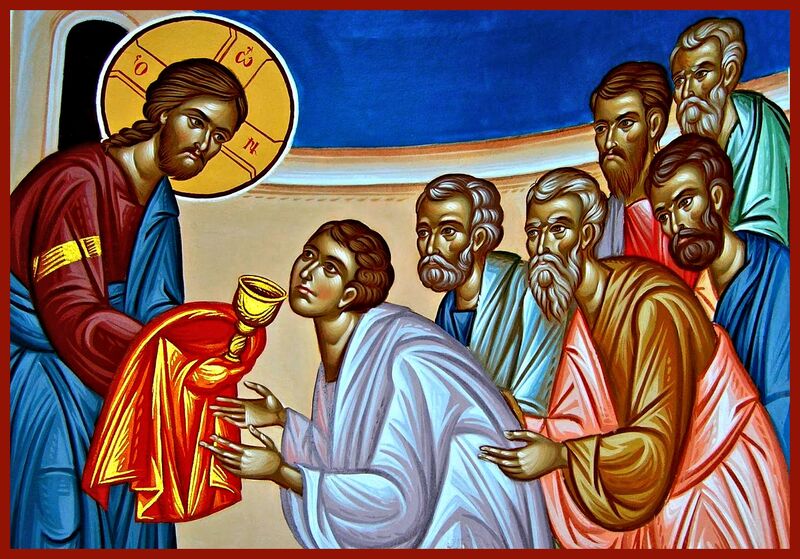 When a man’s nous has been discovered, when he has been freed from his captivity and received the Holy Spirit, it is spiritual priesthood and then he celebrates a mystical liturgy in the sanctuary of his soul and partakes of the lamb in betrothal with God. In this spiritual priesthood he eats the Lamb of God in the spiritual altar of his soul, but at the same time he becomes like the lamb. Thus we understand well that when noetic prayer is working in us, there is an unceasing divine liturgy which nourishes our whole existence. St. Gregory of Sinai writes: The noetic work of the nous is a spiritual liturgy. Like a betrothal before the coming delight which surpasses all understanding, this liturgy is performed by the nous, which mystically sacrifices the Lamb of God on the altar of the soul and partakes of it. To eat the Lamb of God on the inner altar of the soul means not only to apprehend it, or partake of it, but also to become like it in the future life. Here we enjoy the words of the mysteries, but there we hope to receive their very substance. The same saint also writes that the kingdom of heaven is like the tabernacle fashioned by God for Moses, for in the world to come it too will have two veils. And all the priests of grace will enter the first tabernacle, but only those will enter the second tabernacle who are henceforth to celebrate in the darkness of theology hierarchically in perfection having Jesus as the first celebrant and bishop before the face of the Trinity. Therefore all who have acquired the gift of theology as we explained it above, that is, all who after natural theoria have entered the divine darkness, are themselves priests of God; they constitute this true and spiritual priesthood. And since they are the spiritual priesthood, they can heal the sick. Nikitas Stethatos teaches that if any priest, deacon, or even monk participates in divine grace with all the presuppositions set down by the Fathers, he is a true bishop even if he has not been ordained a bishop by men. On the contrary, anyone who is uninitiated in the spiritual life is falsely named even if by ordination he is set over all the others in rank and mocks them and behaves arrogantly. Probably what we quoted earlier, that all who constitute the spiritual priesthood can heal the sick, was not well received. However, the teaching of St. Symeon the New Theologian on this point is very revealing. The saint writes that the power of binding and loosing sins belonged only to the bishops, who had received it by succession from the Apostles. But when the bishops became good for nothing, this awesome function passed to priests who led a blameless life worthy of the grace of God. When the priests too, along with the bishops, fell into spiritual error, this function was transmitted to the chosen people of God, namely the monks, not that it was taken away from the priests and bishops, but they estranged themselves from it. According to St. Symeon, the power of binding and loosing sins was not given simply because of their ordination. The laying on of hands only gave the metropolitans and bishops permission to celebrate the Eucharist. The power to remit sins was given only to those of the priests and bishops and monks who could be numbered among the disciples of Christ on account of their purity. We believe that St. Symeon developed this teaching in the first place in order to emphasize that the sacrament of priesthood did not magically transmit the authority to forgive men their sins if one did not have inner spiritual priesthood; secondly, to show the wretched state of the clergy of that time; thirdly, to underline the value of the spiritual priesthood, which lies in noetic prayer and vision of God and these unfortunately, then as now, were neglected; and fourthly because he himself had personal experience of this: his spiritual father, who had not been ordained by a bishop, had the grace of the Holy Spirit and was able to forgive sins. Nevertheless, his spiritual father, Symeon the Pious, did not overlook the sacrament of ordination. St. Symeon the New Theologian writes: I know that the grace of binding and loosing sins is given by God to those who are sons by adoption and his holy servants. I too was a disciple of such a father who had not received the laying on of hands on the part of men but who through the hand of God, that is, the Spirit, enrolled me among the disciples and ordered me to receive the laying on of hands by men according to the prescribed form I who for a long time had been impelled by the Spirit toward such a reality. He continues: Having heard the commandments of Christ, he became a partaker of His grace and of His gifts and received from Him the power to bind and loose, kindled by the Holy Spirit. When we speak of remission of sins we should understand it mainly as the curing of passions. Thus we see clearly today that gifted monks heal us without having sacramental priesthood. Being clear-sighted, they perceive the problem which is troubling us, they give us a remedy and a method of healing, and so we are cured of what was inwardly disturbing us. The existence of such holy men is a comfort for the people. We come now to the search for therapists. Since we have been made aware of spiritual illness and of the great value of priest-therapists, we must search for them in order to be freed from the ulcers in our souls. A really great effort is needed in order to find these true leaders of the people, the doctors of our souls and bodies, since certainly many bodily illnesses are of spiritual origin. In his homily on the New Sunday Gospel, St. Gregory Palamas advises: Let every Christian after attending church on Sunday diligently seek someone who, imitating the Apostles who were in the upper room after the Crucifixion, remains completely enclosed most of the time, desiring to be with the Lord in silent prayer and psalmody as well as in other ways. Let him approach him then, let him enter his house with faith as a heavenly place having within it the sanctifying power of the Holy Spirit. Let him sit with the man who lives there, let him remain with him as long as he can, asking about God and the things of God, learning with humility and appealing for his prayer. Then, says the saint, I know that Christ will come to him invisibly and grant inner peace to the pondering of his soul and increase his faith and give him support, and in time to come will enroll him in the kingdom of heaven. It is necessary to seek out such a spiritual father. On this point it is worthwhile to listen to what St. Symeon the New Theologian has to say. Ask God, he says, to show you a man who is able to direct you well, one whom you ought to obey. We should show obedience to the man whom God shows us mystically in person or outwardly through His servant, and revere him as if he were Christ himself. We should show our dispassionate spiritual father the kind of confidence and love that a sick person shows to his doctor, expecting treatment and healing from him. Rather we should have even more confidence and love, in view of the difference between the soul and the body. Christ himself is present in the spiritual father. He is the mouth of God. Further on, St. Symeon matches the Apostles’ attitude towards Christ to the attitude which we should have towards our spiritual father, because it is in that way that our soul can be healed. As the Apostles followed Christ, let us do so also. When people dishonor and pour scorn on our spiritual father, we must not abandon him. And as Peter took his sword and cut off the ear, take the sword and stretch forth your hand and cut off not only the ear but the hand and the tongue of him who attempts to speak against your father or to touch him. If you deny him, weep like Peter. If you see him crucified, die with him if you can. If that is not possible, do not join with the traitors and evil men. If he is released from imprisonment, return to him again and venerate him the more, like a martyr. If he dies from ill treatment, then boldly seek his body and pay him more honor than when you attended on him while he was alive, and so anoint it with perfumes and give it a costly burial. O Lord, who desirest not the death of a sinner but that he should turn and live, Thou who didst come down to earth in order to restore life to those lying dead through sin and in order to make them worthy of seeing Thee the true light as far as that is possible to man, send me a man who knows Thee, so that in serving him and subjecting myself to him with all my strength, as to Thee, and in doing Thy will in his, I may please Thee the only true God, and so that even I, a sinner, may be worthy of Thy Kingdom. If a Christian prays in this way, God will show him the spiritual father suitable for him, to tend the illnesses and wounds of his soul. Certainly one should not overlook the fact that such therapists, both in St. Symeon’s time and today, are rare. He says: In truth, those who have the skill properly to direct and heal rational souls are rare, and especially so at the present time. In conclusion, it should be said that it is necessary to seek out and find such scientific doctors, therapists, or even nurses, in order to be spiritually healed. There is no other way of healing. God is our true Healer, but so are the friends of Christ, the saints in whom dwells the Trinitarian God Himself. By Bishop Hierotheos Vlachos, Metropolitan of Nafpaktos and St. Vlassios; excerpt from his highly esteemed book "Orthodox Psychotherapy."